Petr Stepanek claimed a hat-trick for Phantoms in Manchester. 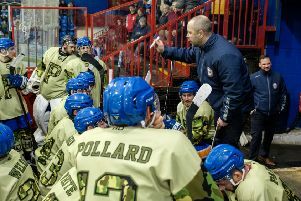 Coach Slava Koulikov heaped praise on his Peterborough Phantoms players following a weekend of maximum points as well as mega miles. The city team retained their third place in the English Premier League courtesy of back-to-back away triumphs made all the more satisfying by shut-outs on successive nights despite being without key defencemen. Tom Norton scored for Phantoms in Manchester. Phantoms followed up a super 2-0 Saturday (January 14) success in Swindon with a far more simple Sunday (January 15) mission against crisis club Manchester. Phantoms cruised to a 7-0 victory at Widnes in what could prove to be the rock-bottom Phoenix’s last-ever game as their future hangs in the balance. That could also mean it becomes a wasted night of work for Koulikov’s men which came complete with a near 350-mile round-trip to the North-West, but the Phantoms chief was not worried about that. Koulikov, a former Manchester player, said: “We’ve done a lot of miles this weekend, but winning both games makes the journeys seem shorter. Phantoms' first-choice netminder Janis Auzins didn't concede a goal all weekend. “Both of my netminders played well and so did the guys in front of them as we put in two terrific team performances. “I do believe that if we can perform like this in the next week, we will have a good chance of reaching the cup final. “Going to Swindon and shutting out a team with so much firepower was an excellent achievement, but we knew we had to follow it up. “We couldn’t think about Manchester’s situation. It was a case of having to be professional and do our job of winning the game. “It gave us the opportunity to work on certain things that will help us to prepare for the big games we have ahead. “It’s obviously sad to see one of my former clubs struggling and I just hope it gets resolved in such a way that they can move forward. While they were kind post-game words from Koulikov, his players certainly didn’t show any sentiment on the ice. Only the frequent excellence of Phoenix netminder Stephen Fone restricted Phantoms to a single goal in the opening period. It arrived from Petr Stepanek who reacted quickly to tuck away a loose puck after a Martins Susters shot had squirmed through the pads of the home custodian. Otherwise Fone was in exemplary form with a series of fine stops while Phantoms goaltender Janis Auzins was rarely called into action. Phantoms needed only 20 seconds of the middle session to double their advantage. Edgars Bebris hit the first goal of his second spell as a Peterborough player – and it came against the club he left last week. Stepanek struck again soon after the mid-point of the contest to leave Phantoms in control although there was a scare when Vaclav Meidl tipped a shot against a post at the other end. Back-up netminder Adam Long had replaced Auzins by that point with the duo combining for an 18-shot clean sheet. Phantoms man Bebris was also denied by the pipes late in the second period, but he did succeed in lighting the lamp again as Phantoms struck four times in the space of seven minutes during a final session in which Manchester wilted. Stepanek launched that late salvo by completing his hat-trick before Bebris guided in his second goal of the night. It also earned him a treble of sorts as he assisted the Stepanek effort moments earlier. Wehebe Darge added a simple sixth goal with its architect, Darius Pliskauskas, securing a hat-trick of assists in the process. A blue-line thump from Tom Norton completed the scoring on a night when Phantoms could easily have doubled their goal tally. They fired in 57 shots on Fone’s target and also missed it with plenty more. Phantoms were without defensive duo Scott Robson and Ben Russell all weekend. Captain James Ferrara was also given last night off with his wife expecting their second child any day. Will Weldon made a welcome return against Manchester after being out with a knee problem since Boxing Day. Fellow forward Marc Levers has now undergone hernia surgery and faces a four-to-five week recovery, according to Koulikov. Phantoms are back in action on Wednesday (January 18, 7.45pm) when they entertain table-toppers Telford in the first leg of an EPL Cup semi-final. The second leg is in Shropshire on Sunday (January 22) with Phantoms aiming to reach the final for the second successive season. Phantoms also squeeze in a league fixture at the weekend. They host Hull on Saturday (January 21, 7pm).